Objective – This study aimed to identify assessment opportunities and stakeholder connections in an emerging technologies department. Such departments are often overlooked by traditional assessment measures because they do not appear to provide direct support for student learning. 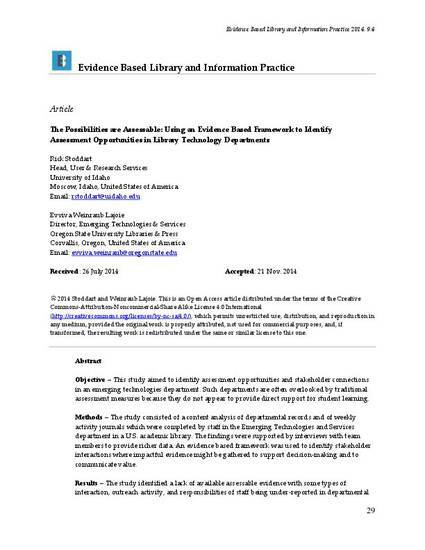 Methods – The study consisted of a content analysis of departmental records and of weekly activity journals which were completed by staff in the Emerging Technologies and Services department in a U.S. academic library. The findings were supported by interviews with team members to provide richer data. An evidence based framework was used to identify stakeholder interactions where impactful evidence might be gathered to support decision-making and to communicate value. Results – The study identified a lack of available assessable evidence with some types of interaction, outreach activity, and responsibilities of staff being under-reported in departmental documentation. A modified logic model was developed to further identify assessment opportunities and reporting processes. Conclusion – The authors conclude that an evidence based practice research approach offers an engaging and illuminative framework to identify department alignment to strategic initiatives and learning goals. In order to provide a more complete picture of library impact and value, new and robust methods of assessing library technology departments must be developed and employed.